WASHINGTON -- Republican leaders in the House of Representatives plan to outline broad immigration principles, including legalization for the 11 million immigrants living here illegally, to the party's rank and file members as they look to revive long-stalled efforts to overhaul the U.S. immigration system. The party's leadership faces strong opposition from several conservatives who fear that legislation will lead to citizenship for people who broke U.S. immigration laws, are suspicious of President Barack Obama's agenda and are reluctant to give the president a long-sought legislative victory. Republican House Speaker John Boehner and other House Republican leaders will measure the willingness of party members to tackle immigration in a midterm election year when they unveil the principles Thursday at the party caucus' annual retreat in Maryland. At a press conference Thursday morning, Boehner signaled his intent to push forward, but he declined to spell out many specifics ahead of a meeting with his caucus. "This problem's been around for at least the last 15 years," he said. "I think it’s time to deal with it but how we deal with it is critically important." Boehner reiterated his desire for a "step-by-step" process in lieu of a comprehensive bill, and he said border security would necessarily be the "first step," but when he was asked about other concerns his conservative members might have, he demurred. "I’m sure we’ll hear about it today from our members," he said. The statement of principles leaders were expected to unveil Thursday would focus on border and interior security, legalization with the requirement that immigrants pay fines and back taxes, and ensuring that Obama enforces any law on the books, according to lawmakers, congressional aides and outside advocates familiar with the draft. They spoke on condition of anonymity because they weren't authorized to publicly discuss the principles. 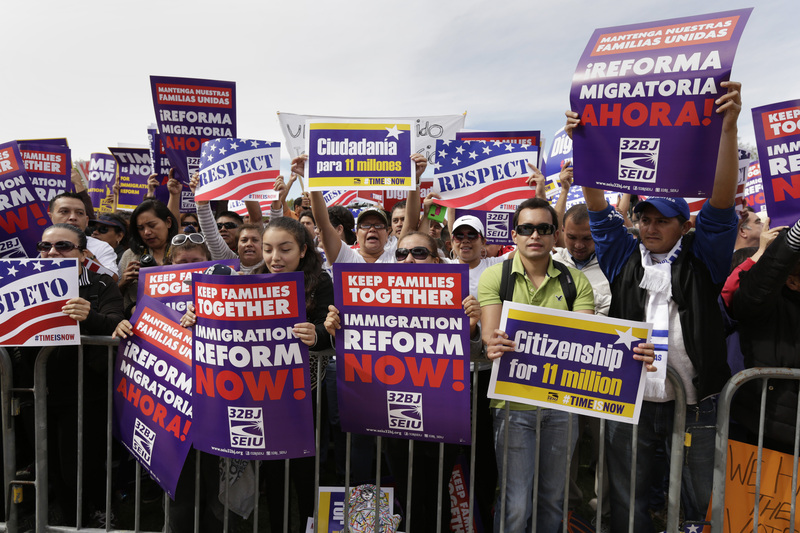 Most House Republicans reject a comprehensive approach to the immigration reform. Only single-issue immigration bills have moved forward on a piecemeal basis in the Republican-controlled chamber. Despite the reluctance of rank-and-file House Republicans to deal with immigration, their leaders insist they want to solve the issue, which has become a political drag for the party. After Obama won almost 70 percent of the Hispanic vote in his 2012 re-election, some Republicans in the Senate expressed concern that the party's opposition to immigration reform could hurt future election prospects by alienating the rapidly growing Latino voting bloc. Last June, 68 Democratic and Republican senators in the 100-seat chamber joined together to pass a comprehensive bill that would provide a path to citizenship for immigrants living in the U.S. illegally and tighten border security. The bill stalled in the House, and some conservative Republicans in both chambers remain staunchly opposed to offering illegal immigrants a path to citizenship. Alabama Sen. Jeff Sessions, the top Republican on the Senate Budget Committee, delivered a 30-page package to all 232 House Republicans on Wednesday that offered a point-by-point rebuttal to the party's expected principles. Sessions warned of the negative impact of proposed changes in immigration policy on U.S. workers, taxpayers and the rule of law as the House leaders look at legalization for some of the 11 million immigrants living here illegally. Sessions and other opponents argue that legal status and work authorization amounts to amnesty and serves as a path to citizenship. Responding to Obama's renewed call for immigration legislation and the positive signals from House Republican leaders, Sessions said Republicans "must end the lawlessness - not surrender to it - and they must defend the legitimate interests of millions of struggling American workers. Sessions' analysis said increasing the number of immigrants would hurt an already weak economy, lower wages and increase unemployment. He cited White House adviser Gene Sperling's comment earlier this month that the economy has three people looking for every job opening. He said the House Republican leaders' plan that's taking shape would grant work permits almost immediately to those here illegally, giving them a chance to compete with unemployed Americans for any job. He said it would lead to a surge in the future flow of unskilled workers and would provide amnesty to a larger number of immigrants in the country illegally, giving them a chance to apply for citizenship through green cards. The Associated Press obtained a copy of Sessions' critique. Separately, several lawmakers were working on legislation dealing with children of parents living in the United States illegally and visas for guest workers. "It's no secret we have millions of people who are here, who are unlawful and we can't deny that, and I think that's something that has to be dealt with," said Republican Rep. Mario Diaz-Balart, who has been working on legislation. "But a lot of components have to be dealt with." Notably, two members of the House leadership, Boehner and Rep. Cathy McMorris Rodgers, spoke about dealing with the broken immigration system in their responses to Obama's State of the Union address Tuesday. Diaz-Balart expressed cautious optimism, putting the odds of House action on immigration at 30 percent, up from 5 percent earlier.